Last week, in part one of this post, I talked about the rise of the creative class and the new urban crisis we find ourselves in following the success of knowledge clustering. This week I want to talk about inclusive growth. Inclusive growth is contrasted with exclusive growth. Exclusive growth is, by and large, the kind of growth we have seen accompany the knowledge clustering of the creative class. Exclusive growth increases economic inequality and segregation. Exclusive growth creates barriers to opportunity and makes upward social mobility more difficult. Inclusive growth is meant to do the opposite: to remove barriers to opportunity, to make upward social mobility easier, and to decrease economic inequality and segregation. Inclusive growth is our best bet for dealing with the new urban crisis according to Richard Florida. 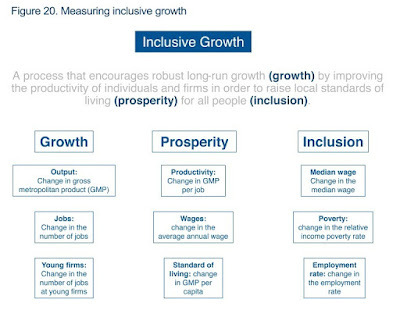 Inclusive growth is about equality of opportunity and growth for all. The focus is not just on economic expansion, it is also on making each person’s economic situation better—especially the middle and lower classes, who aren’t often affected positively by economic expansion (as we saw in part one of this post). In September, the Brookings Institution published a report on the importance of inclusive growth for local economies: Opportunity for Growth. This report defines inclusive growth as “a process that encourages long-run growth (growth) by improving the productivity of individuals and firms in order to raise local living standards (prosperity) for all (inclusion).” They argue that inclusive growth is important because reducing barriers to economic opportunity can enhance economic growth. Metros with greater equality of opportunity have higher aggregate growth. Why is that? According to their research, it is because they maximize the potential of the talent and entrepreneurship bases on which their growth and productivity depend and when they do that they also minimize fiscal and social costs of exclusion fostering environments that allow for better collective decision making about their economic future. Ultimately, inequality of opportunity hinders long-term competitiveness. The report identifies economic development organizations (EDOs) as potential anchors in developing inclusive growth coalitions. EDOs serve as agenda setters for their regions and they bring together key players to develop strategies and collaborate on putting their strategies into action. New practices and new policies will need to be developed to promote inclusive growth and they will likely require new partnerships to put them into action. This is where EDOs shine. In order to promote inclusive growth, EDOs will need to create goals and incentives that will promote the removal of these barriers to opportunity. The first step for most communities and regions will be to convince members, boards, and partners that inclusive growth is fundamentally an economic development issue. This will require compelling evidence. 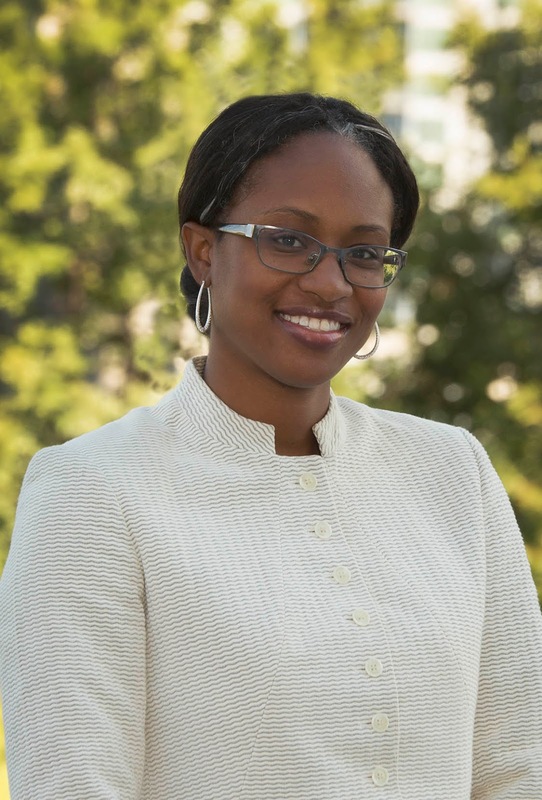 As part of the Inclusive Economic Development Learning Laboratory, Brookings worked with three US cities to undertake the challenge of reorienting their economic development goals and practices towards inclusive economic development. Committing to inclusive growth, a companion paper to the “Opportunity for Growth” report, documents this six-month process in EDOs in San Diego, Nashville, and Indianapolis. The paper contains lessons from the work in these three metros to create a deeper understanding of their local inclusive growth challenges; to provide a clear business case to their members, boards and partners for how inclusion enhances growth; and to establish the outlines for how they will respond to the challenges identified. In each EDO, the process was structured around five core questions. 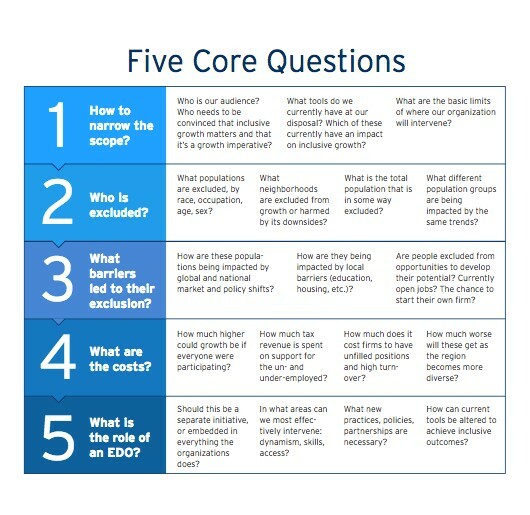 For EDOs grappling with how they can reposition to promote inclusive growth, asking (and honestly answering) these questions is an excellent place to start. From there, a distress score is calculated by taking the average of the rankings in each of the data indicators. Then, the geographies are grouped into quintiles: “distressed” refers to the worst-performing quintile, the fourth is “at risk”, the third is “mid-tier”, the second-best is considered “comfortable”, and the best-performing quintile is “prosperous”. This was done for ZIP codes, cities, counties, and states. The following are high-level and very intriguing takeaways from the report, shedding light on characteristics of and disparities affecting distressed communities across the nation. 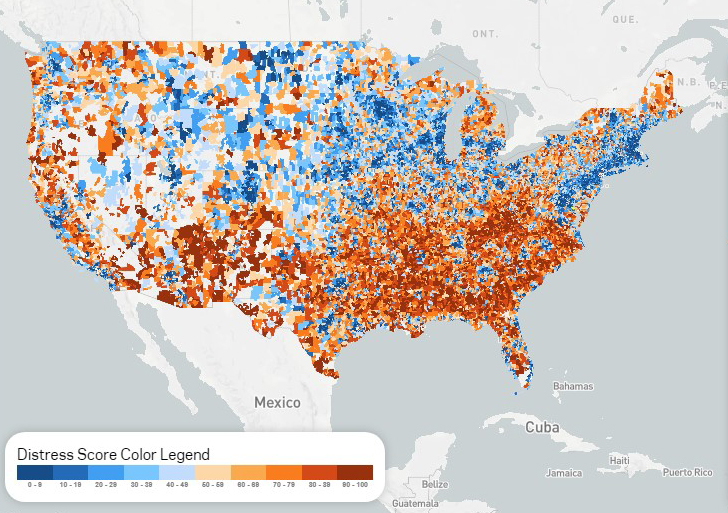 One in six, or 52.3 million, Americans live in economically distressed ZIP codes. Of these, approximately 13 million are children. 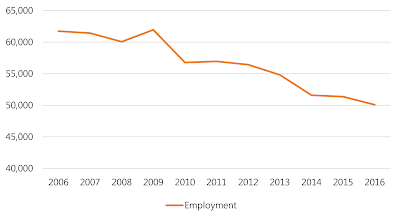 Distressed communities collectively have not yet recovered from the recession, with a 6.0 percent average decline in employment and a 6.3 percent average decrease in establishments from 2011 to 2015. Meanwhile, the country as a whole added 10.7 million net jobs and 310,000 net establishments. Over half of the national increase in establishments (57 percent) and in jobs (52 percent) occurred in prosperous communities. Many of the distressed ZIP codes have experienced no gains at all since 2000, long before the Great Recession. 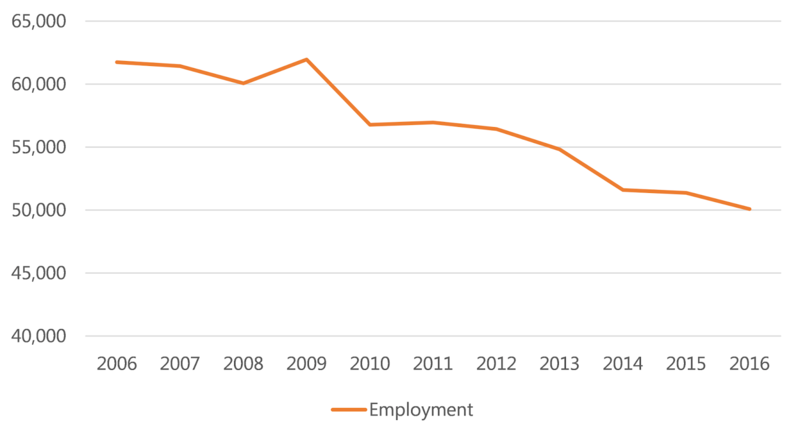 In fact, two-thirds of distressed ZIPs had fewer jobs in 2015 than they did in 2000. Over half of the nation’s population living in distressed ZIP codes live in the South. In the South, distressed communities are primarily rural. In the Northeast, these communities are mostly urban. In the Midwest, distressed populations are pretty evenly spread across neighborhood types. Prosperous communities are largely suburban. Not surprisingly, understanding the close link between economic well-being and physical health, the average life expectancy is shorter in distressed ZIPs – nearly five years shorter than residents of prosperous ZIP codes. Mental illness, substance abuse, and life-threatening diseases are more prevalent in distressed communities. Research shows that if in a distressed community, a person with disabilities is more likely to leave the labor force. Most minority groups are overrepresented in distressed communities and underrepresented in prosperous ones, while white and Asian residents are overrepresented in prosperous and comfortable ZIPs. 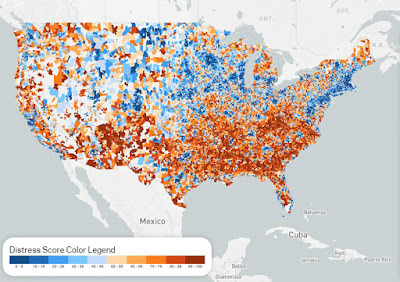 However, though they are underrepresented in distressed ZIPs, white residents make up the largest demographic living in distressed ZIP codes, accounting for 22.9 million of Americans living in the lowest quintile communities. Why does this matter? It’s important for regions to understand intraregional dynamics, understanding that some areas may need more attention, more investment, and different approaches than others. To ensure that communities are thriving, understanding the linkages and likelihood for success of the varying levels of prosperity or lack thereof can help guide solutions. 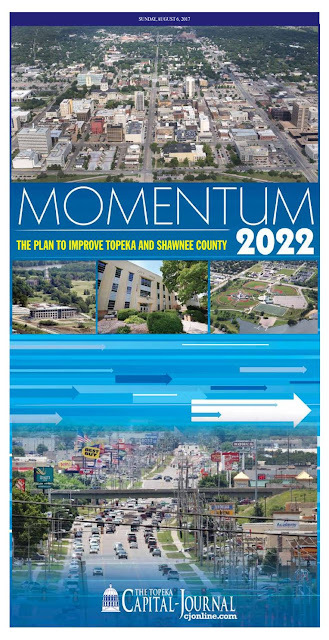 Keeping in mind that quality of place is one of the top two priorities in economic development today, behind only talent, improving distressed communities can only make regions more attractive, thereby making them more competitive for talent and jobs. Take a look at this report for more details of how distressed communities compare to others, and take a look at the website to find out how your community fares.